Last week, Anonymous hacked a Speed Camera Database in Italy, the hacktivists took control of a local police computer system in Correggio, Italy and erased the entire archive containing speed camera tickets. The hackers also released internal emails and documents. The hackers provided screenshots of the attack to several Italian newspapers, it seems they have wiped an entire archive containing 40 gigabytes worth of infringement photographs. The Anonymous hackers sent a message using the e-mail account of the Correggio municipal police. “Ho Ho Ho, Merry Christmas,” read the message from Anonymous. The message announced the hack of the Concilia database and of the system developed by the company Verbatel, it also included the links and passwords to download them. 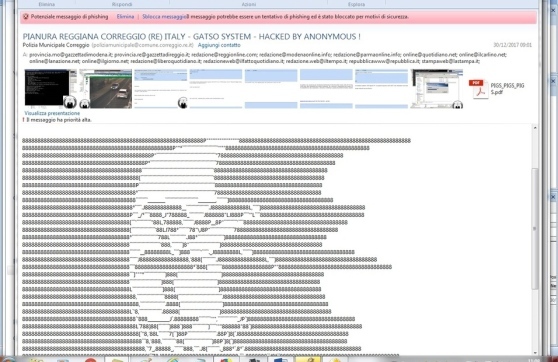 The message includes screenshots of the hack, one of them show a Windows command line likely related to the hacked computer of the Correggio municipal police. Two images show claims from two motorists complaining that they received tickets from Correggio speed cameras, even though they had never passed through the area. Emails between police administrators and local politicians discussed how the speed camera profits were to be distributed. One of the screenshots is related to an email sent by an employee at Correggio data center who explains that he has restored the Concilia DB using a backup dated Dec. 5 due to a serious problem. The police are still investigating the case.